At the SSF we do what we can to minimize member's exposure to Internet's trackers, stalkers and privacy thieves. When members post photos or links in a thread/post that reach out to third party sites then your browser can/will leak all kinds of info to the third party. The public is beginning to become aware of just how serious the Internet stalking & Privacy issues are. Most of the current headlines are about the government. BTAIM, I believe the bigger problem is companies, large and small. The government has more laws to abide by and watchdogs keeping an eye out than Corporate America and their marketeers do. And its not just the Internet, please know that discount cards, bonus cards, membership cards, credit cards, etc. are all part of the overall formula. Today more & more stores are figuring out that their profits aren't in the products you buy but rather in selling to others details about what it is you bought. Corporate America and Global Marketeers add this info to the info they have already managed to collect about you and your habits/preferences. This is too large of a topic and is off topic for the SSF. Basically the information collection is done to eliminate free will and to bend people in a direction that serves big business interests. I would encourage members to become more aware of just how fast individual privacy is disappearing both on the Internet and in the real word. To take steps to better protect your privacy. Ghostery is a tool recommended by NPR for seeing and blocking trackers. I use Ghostery. It helps but it is only one of the small "one off" defensive tools that can't compete against resources of large Corporations and the large criminal networks. Don't misunderstand, I think we all should employ whatever tools available but don't let these tools fool you into a false sense of security. Also when using these tools they can have conflicts with each other and they can break web pages. Re: "false sense of security"
These tools are often better about blocking the ads from appearing on the WEB page then actually hiding you and your personal info from the trackers. I don't know of a one size fits all solution. I don't think the Good Guys and Privacy Advocates have the resources to fight the good fight. I don't think things will get better unless everyone shares a unified voice of outrage. So tell businesses that they will get less of your business if they continue to track/data mine you. Tell regulators they must do more to set standards to protect your privacy. And to enforce those standards and to prosecute criminal acts (especially internationally). There are other "free" products ... some good and some not so good. And some of the programs, both "free" and paid, are a wolf in sheep's clothing. If you have something to recommend we would love to heard about it. To Everyone - caveat emptor. Nothing posted here is to be assumed effective and/or safe. Another is Adblock Plus a browser extension available on Firefox. I'm trying out Ghostery. It reports this page as having only one tracker which I have blocked. Some pages have as many as 24 so far. Ghostery shouldn't find any trackers at the SSF unless the thread you are looking at has photos that link to a third party site which has tracking. For example, when a thread/post at the SSF has photos hosted on third party site (like: Photobucket) then Ghostery will report a tracker was found. I use Ghostery and on this page there are no third party images therefor Ghostery reports 0 trackers or No trackers. So if your installation of Ghostery is reporting a tracker for this page then something is wrong. Ghostery might not have installed properly. Ghostery might be detecting some spyware on your machine. Out of curiosity, for this page, what tracker is Ghostery reporting? As of this reading, it is reporting none. When I went to install Ghostery from the link in the NPR story, my Norton blocked it saying it was an "Ad CrossID" threat. So is it safe to download? Norton told me not to download also as this was a virus threat. In both cases there isn't enough info to begin to speculate as to why. Although I can't provide support, I am sympathetic. Please understand that I can barely manage my own defenses and I am more technical than the average person. I pretty sure it was 1983 the last time there was a techie who knew everything about computing. I use Norton AV but the rest of the Norton 360 stuff is not being used because there were too many false positives and distractions caused by it. 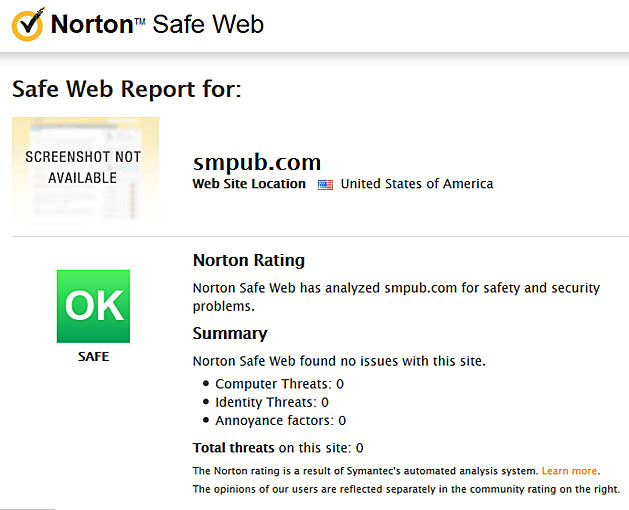 My Symantec Norton AV doesn't complain (and it is up to date and it is really working) so I will guess you are getting the warning because it is a false positive from Norton 360 or because Norton no longer considers Ghostery a valid app since Ghostery now allows some paid advertisers like Google to bypass Ghostery. Another possibility is that you are infected with Malware/spyware and the Malware/spyware is defending itself. This can happen if the Malware/spyware has been able to install its bad self as a Rootkit. A Rootkit is some program that installs before the operating system and other defenses like AV. By installing before the operating system and other defenses the Rootkit is near impossible to detect. You can find Rootkit removal tools. Even so, most of the Rootkit removal tools are limited to a specific or just a few well known Rootkit infections. There is no universal Rootkit detection and removal tool. There are Rootkits (& regular viruses) that can randomly change their configuration and that makes it very difficult for the Rootkit to be detected. There are also Rootkits (& regular viruses/malware/etc) that when the Rootkit detects they are being removed then they encrypt and hide in your PC. And then they will re-install after the next reboot or some other event. Sometimes it requires a complete reforming of the hard disk and clean new install to get rid of a Rotkit. Another tool to consider to defend against infections and unauthorized PC changes is to use a sandbox. If you are infected a sandbox won't help but if you are uninfected than it will do a lot to keep you uninfected. In computer security, a sandbox is a security mechanism for separating running programs. It is often used to execute untested code, or untrusted programs from unverified third-parties, suppliers, untrusted users and untrusted websites. The sandbox typically provides a tightly controlled set of resources for guest programs to run in, such as scratch space on disk and memory. Network access, the ability to inspect the host system or read from input devices are usually disallowed or heavily restricted. In this sense, sandboxes are a specific example of visualization. Based in the Netherlands is a Search Engine called Startpage. Startpage says they are not subject to government snooping. And according to their privacy statement, no records of user data are kept. Please understand Startpage must know your IP when you connect and then claim not to record or store your IP and geographical location. They don't use tracking cookies. Therefore it is their claim that they have no information to give to anybody or to share, even if they are asked. Startpage claims to act as proxy to the Google and as such Google and their Advertisers don't know that it is you or about what it is you searched because Google only sees the search as coming from Startpage. That is, until you click a search result. Once you click on a search result you pass from Startpage to whatever it is you clicked. Therefore the destination and all the other stuff hidden at the destination will see it is you when you arrive at the destination. Startpage offers a minimal proxy service to mitigate this issue. See the video:Startpage's New Proxy Service! If you connect to Startpage make sure the URL is using a secure encrypted link (https://) like https://startpage.com/ . What this does is encrypts the data-stream between your browser and Startpage. An https connection makes it a lot of work for your ISP to snoop on what it is you are doing at Startpage. Q: How does Startpage make money if it doesn't store or sell my personal data? Startpage shows a limited amount of relevant sponsored results on the top and the bottom of the results page. Each time these sponsored results are clicked upon Startpage receives a minimal fee from the advertiser. I wonder if Startpage will channel other search engines like Bing? I wonder why Google lets them connect? I wonder how long before Google figures out how to defeat Startpage? There is lots of other stuff to wonder about but for now Startpage is looking like another good privacy tool. Another privacy search engine is DuckDuckGo. How-to stop getting tracked in your Browser. I never expected anyone to reply in this thread. My time is limited and it was just meant to be somewhat helpful. If you found the info helpful and would like, from time to time, other suggestions please let me know. If you don't want to post in this thread or can't post to this thread then email me at info@SMPub.com?subject=Internet%20privacy . I do appreciate what you have posted. I use DuckDuckGo and have for awhile. I am still trying to figure out about the Ghostery and Norton issue. While I understand the need to generate revenue it seems like the internet is becoming way more intrusive than it needs to be. The other day I was on the Sferra and Container Store websites and after that it seemed like every page I went to had an ad for both companies. If the only way they know to "advertise" to me is after I visit the website, that seems kinda backwards. It drives me to distraction. I remeber when the "loyalty cards" are grocery stores was picking up in popularity, someone had come up with a fake name and info that was posted and passed around so that this fake person was registered at just about every store and really messed up the companies stats on who was buying what! I wish I could remember that name now. "...I remeber when the "loyalty cards" are grocery stores was picking up in popularity, someone had come up with a fake name and info that was posted and passed around so that this fake person was registered at just about every store...."
That only worked for those who used cash. The stores soon figured out that they could distinguish & track the buyer's purchases by linking the discount card to the various credit cards. So a man with the "loyalty card for John Doe" using CC1 and woman with the same "loyalty card for John Doe" and CC2 may to the average observer seemed like they are unrelated. But not to trackers, they use algorithms that tell them that CC1 & CC2 bill to the same address therefore this shows that the man & woman are in the same household for tracking purposes. This example is simplistic; the algorithms they actually employ are much complex and sophisticated and can reveal much more. Soon it won't matter if you pay cash or credit because they will be using facial and/or voice recognition at checkout to ID you and to link your purchases to your history. In the news this week, was a story about a chain store that uses your cell phone signal to monitor where in the store you go and how long you spend in a particular isle/location. And if you have an "app" of some sort, say a comparison shopping app, it is pretty certain that app will tie into what the store is doing to physically track you. Most apps can run unseen by the "smartphone" owner. So if the "smartphone" is on and getting a signal then it is fairly certain that the apps are sharing info about you the "smartphone" owner, where you are, what you might be doing and then they get busy with those complex & sophisticated algorithms to update/refine what it is they know about you/your household/your family and even your employer. Today big business uses convenience and modern "smart" tech to do what they can to control the masses, one person, one household, one community,..... etc., at a time. Everyday "smart" tech gets more powerful and more & more people love their "smart" tech....and yet no one seems to notice that in mass everyone is getting more stupid. I haven't used this (yet) but there is another tool that is getting some good press, Maskme. Here are twelve essential points that everybody should know about privacy on the Internet. Keep these basic privacy concepts and practices in mind and you will be better able to guard your privacy and reduce intrusions into your life. There is no such thing as 100% privacy on the Internet. You can take steps to lessen the intrusions into your privacy but there is no way to guarantee that nothing can be learned about you and your affairs. Learn to live with this reality and act accordingly. Like it or not, you have to trust somebody. Anything you do on the Internet has to go through numerous intermediaries, routers, networks, etc. Ultimately, you have to trust the security of your ISP and other services that you use. VPNs and proxy servers can increase your security but they are not foolproof. Privacy comes at the cost of convenience. The more measures to increase privacy that you use, the more cumbersome using the Internet becomes. Locked doors are harder to use than open ones. The correct trade-off between privacy measures and convenience depends on how you use the Internet. If you like to live dangerously, you may need a lot of privacy measures. If you are a casual web surfer and send harmless emails, not so much. Choose the level of privacy appropriate to your Internet usage. There are innumerable ways to spy on wireless or cell connections. There is no standard encryption that can’t be broken and deciphered but using a strong version of WPA encryption on your wireless router is better than not. Avoid using public hot-spots for private business. Assume that all email that you send is public. If you must use email to send sensitive material, use some form of strong encryption. Send the encryption key to the recipient by some other means than email. Deleted email is probably still there somewhere. You may delete an embarrassing or private email but it may very well still be on the email servers or on the other party's computer. Everything you do or say on the Internet is recorded somewhere, usually in numerous places. You can take measures to make it hard to trace your Internet actions back to you personally but there is always the chance that a persistent and technically adept person or agency can track you down. However, most of us aren't important enough to warrant that kind of effort. What you post on social sites might as well be on a public bulletin board. Privacy measures at Facebook and other social sites are full of holes. Assume that anybody can see what you post. Use disposable email addresses and pseudonyms as much as possible. Don't reveal anything you don't have to when signing up for some service. Assume any information you reveal on one site gets shared or sold. It is almost impossible to remove all traces of something once it is on the Internet. Those pictures of yourself that you posted when drunk can come back to haunt you years later. Advertisers want to track you. Advertisers want to know as much as possible about your activities so they can target their ads for you. They keep developing more and better methods to track your Internet activities. Gizmo’s has many articles about ad blocking and control of tracking cookies. Monitor your credit cards and bank accounts daily. Personal records stored in company databases are stolen all the time. If you have online credit card accounts, monitor them for unauthorized activity daily. Also monitor any online banking or financial accounts daily. Browser vendors continue to implement privacy in a halfhearted way, with Internet Explorer's default use of cookie "do not track" technology being the best of a weak job, a new assessment by NSS Labs has argued. Currently, the latest versions of all four leading browsers—IE, Firefox, Chrome, and Safari—implement Do not track - but only Internet Explorer 10 installs it switched on by default, NSS Labs' latest Comparative Analysis found. The cookie-tracking setting can be enabled in the other three, but only by locating an option in a menu setting. The authors are especially critical of Chrome, which requires users to find and expand a nested Advanced Settings tab to enable the feature. Even Microsoft treats the do not track as a design afterthought, burying the settings where only the most curious non-expert users might chance upon it. NSS Labs interprets this lack of enthusiasm for the setting as revealing each vendor's "philosophical views on consumer privacy," while accepting that do not track remains ineffective as a privacy control while advertisers remain free to ignore it as they please. "Until legislation is passed that will mandate compliance with the user intent of Do not track, the feature will remain a polite request that will be ignored by the advertising industry," write authors Randy Abrams and Jayendra Pathak. With third-party cookies, Safari and IE are given the thumbs up, with the former blocking all by default, and IE implementing a partial block. Although Firefox and Chrome don't activate this setting by default, Firefox in particular offers granular control over a setting that is vital to automate access to many commonly used sites. Other privacy features—the ability to control geolocation, private browsing, and tracking protection lists—all fall down to some extent. Controlling geolocation (the ability for a site to detect a user's country location), all four browsers prompt as required, but in order to disable the setting completely Firefox forces users to access the technically demanding about:config page. Uniquely, IE9/10 allows Tracking Protection lists from third-party vendors, essentially lists of sites for IE to block third-party cookies automatically unless the setting is overridden by the user. Overall, then, IE comes out on top for privacy thanks to the relative simplicity of its slider controls and privacy templates, but none of the four are given a ringing endorsement. It remains unclear to what extent browser privacy and features such as do not track are valued or even understood by users. A YouGov poll from late last year found that consumers valued ease of use more highly than the ability to block cookies, although the same survey admitted that many disliked targeted ads which follow users even when they have left sites. Do not track has certainly upset some advertisers, with the Digital Advertising Alliance (DAA) recently lobbying a W3C discussion on how to standardize the way that not track should work. The more I find out about this - well, not a good thing. Driver-less vehicles pose a bigger threat to privacy than the NSA ever will. If you haven't heard of Mixpanel.... read below. Mixpanel offers an 'Opt out' but this only limits some of the Mixpanel tracking. And it only works if Mixpanel actually respects their 'Opt out' cookie and you don't delete the 'Opt out' cookie. But the 'Opt out' is not a cure because they are still using more advance techniques to individually ID and track you regardless of what they do/don't do with cookies. MixpanelNext up in our coverage of specific tracking companies we’ve added to DoNotTrackMe’s block list is Mixpanel. What’s most unique and concerning about Mixpanel from a privacy perspective is that they advertise that they can tie their incredibly detailed tracking data to specific individuals. Although it happens and it’s certainly been done before, advertisers typically don’t admit it: they focus on data being aggregated and “de-identified” and thus lacking privacy risks (which isn’t always true, but that’s the industry stance and one of their key talking points). Mixpanel is coming right out and marketing its tracking tools based on the ability to identify individuals. On their website, they say “Now you can tie any kind of data to your users to see exactly who they are and what they have done.” They even show a screenshot of their user interface showing incredibly detailed facts about individuals listed by name, with a photo, their email, their home town, their site activity, and more. They’re still being a bit cautious about it–their page discussing the feature isn’t linked to from their main site and took some digging to find–but it seems they’re aware that what’s a privacy death sentence for most advertisers could also be a major selling point for their advertiser customers. Mixpanel’s dashboard lets websites and advertisers see visitors’ personal, individual details. Mixpanel says they’re tracking 6.2 billion web and mobile user actions each month. These actions include a user’s demographic info, referrer info, and detailed site actions (like whether they opened a drop-down menu, clicked a button, put something in their shopping cart, or even hovered their mouse in a certain area for longer than average). If you have a smart phone and want to turn off Google's cookies/DART cookies consider the following "how to" provided by this Google Policies & Principles page (Overview>Technologies>Advertising). A little while ago our ISP stopped offering Urchin for web site analytic's. Since looking at the stats is more a curiosity/info thing for us we weren't quick to investigate the stats program they now offer called Analytics. About a week ago we turned Analytics on. Yesterday we noticed that Ghostery was indicating a tracker at SMPub.com. At first we thought it might be from a third party hosted image. Deeper inspection revealed it originated with our ISP and routed to a third party (Aplus Analytics owned by Deluxe Corporation). We might have made the leap of faith that the info collected was to only to service us but we see that Aplus Analytics is sharing the data with others. Not knowing exactly what info they are collecting and sharing or whether all the info being collected is non-personnelly identifiable... we felt the need to shut it down. So we have turned off (for now) the ISP provided Analytics. As such, we will no longer know our hit counts, etc. in a aggregate fashion unless we find a way to utilize the server logs (unlikely). Most free sites are not free! The "free" sites use the data plan you are paying for to send unrequested/undesired data/background apps to you. The Internet sites like Facebook, Photo sharing sites, search sites, etc. are getting sneaker so you will most likely not notice just how massive their unrequested/undesired data/background apps abuse is. Not noticing can cost you real money. For example: You may be looking at a photo which isn't too big (55k), but the web site serving it up has a lot background programs being quietly downloaded in the background and run (i.e., spyware, data mining, back ground site management apps, etc. etc.). These background tasks can and often do use many megs of your data plan even though what you are looking at is only 55k of your data plan. But when the bill comes in, that 55k photo view costs you 8-10+ megs on your plan. On the internet, there are fewer and fewer truly free sites. SMP and the Silver Salon Forums are one of the few sites that are not spying on you, nor are we running background tasks that use up your data plan. The buzz about the ad blocking extension called µBlock is pretty good. I am trying it out and so far so good. If you have used or are a user of uBlock let us know what you think? There are also some tests. Before installing uBlock I ran the test with only ABP & Ghostery installed. ABP & Ghostery failed some of the tests. TrackMeNot does things very differently ... the idea is not to hide but rather to use noise and obfuscation to mislead the trackers... sort of hiding in plain sight. The tool is new and early in development but so far the buzz has been good. TrackMeNot is a lightweight browser extension that helps protect web searchers from surveillance and data-profiling by search engines. It does so not by means of concealment or encryption (i.e. covering one's tracks), but instead, paradoxically, by the opposite strategy: noise and obfuscation. With TrackMeNot, actual web searches, lost in a cloud of false leads, are essentially hidden in plain view. User-installed TrackMeNot works with Firefox and Chrome browsers and popular search engines (AOL, Yahoo!, Google, and Bing) and requires no 3rd-party servers or services. Here is another privacy tool Epic Privacy Browser. Because it uses a proxy server (among other things) to mask your IP it can appear a little slow to load a page. I suspect as their business model takes hold this will improve (because they will be able to afford more efficient proxy servers) . I tried Epic Privacy Browser with the SSF and it worked just fine. It gets high reviews from c/net and PC Mag. If you find this thread insightful/helpful then you may find this news story found on phys.org (and elsewhere on the WEB) interesting. Navigating the Web gets easier by the day as corporate monitoring of our emails and browsing habits fine-tune the algorithms that serve us personalized ads and recommendations. But convenience comes at a cost. In the wrong hands, our personal information can be used against us, to discriminate on housing and health insurance, and overcharge on goods and services, among other risks. "The Web is like the Wild West," says Roxana Geambasu, a computer scientist at Columbia Engineering and the Data Science Institute. "There's no oversight of how our data are being collected, exchanged and used." With computer scientists, Augustin Chaintreau and Daniel Hsu, and graduate students Mathias Lecuyer, Riley Spahn and Yannis Spiliopoulos, Geambasu has designed a second-generation tool for bringing transparency to the Web. It's called Sunlight and builds on its predecessor, XRay, which linked ads shown to Gmail users with text in their emails, and recommendations on Amazon and YouTube with their shopping and viewing patterns. The researchers will present the new tool and a related study on Oct. 14 in Denver, at the Association for Computing Machinery's annual conference on security. Sunlight works at a wider scale than XRay, and more accurately matches user-tailored ads and recommendations to tidbits of information supplied by users, the researchers say. Prior researchers have traced specific ads, product recommendations and prices to specific inputs like location, search terms and gender, one by one. One tool, AdFisher, received attention earlier this year after showing that fake Web users thought to be male job seekers were more likely than female job seekers to be shown ads for executive jobs when later visiting a news site. Sunlight, by contrast, is the first to analyze numerous inputs and outputs together to form hypotheses that are tested on a separate dataset carved out from the original. At the end, each hypothesis, and its linked input and output, is rated for statistical confidence. "We're trying to strike a balance between statistical confidence and scale so that we can start to see what's happening across the Web as a whole," said Hsu. The researchers set up 119 Gmail accounts, and over a month last fall sent 300 messages with sensitive words in the subject line and body of the email. About 15 percent of the ads that followed appeared to be targeted; some seemed to contradict Google's policy to not target ads based "on race, religion, sexual orientation, health or sensitive financial categories," the researchers said. For example, words typed into the subject line of a message— "unemployed," "depressed," and "Jewish," were found to trigger ads for "easy auto financing," a service to find "cheating spouses," and a "free ancestor" search, respectively. The researchers also set up fake browsing profiles and surfed the 40 most popular sites on the Web to see what ads popped up. They found that just 5 percent of the ads appeared to be targeted, but some seemed to violate Google's advertising ban on products and services facilitating drug use, they said. For example, a visit to "hightimes.com" triggered an ad for bongs at AquaLab Technologies, researchers said. 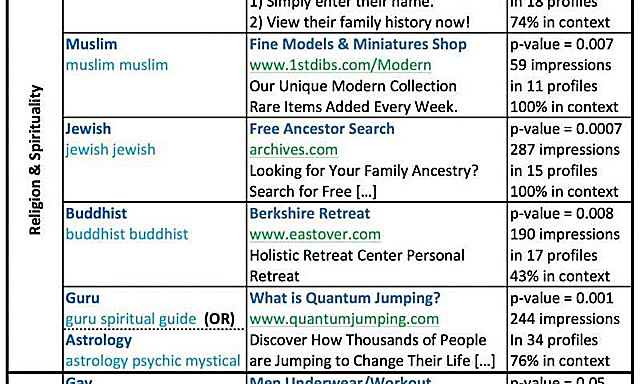 Interestingly, the algorithms also seemed to pick up on the political leanings of popular news sites, pitching Israeli bonds to Fox News readers, and an anti-Tea Party candidate to Huffington Post readers. The researchers caution against inferring that Google and other companies are intentionally using sensitive information to target ads and recommendations. The flow of personal data on the Web has become so complex, they said, that companies themselves may not know how targeting is taking place. In Nov. 10, 2014, Google abruptly shut down Gmail ads - the last day that Geambasu and her colleagues were able to collect data. The ads appear to have been replaced by so-called organic ads displayed in the promotions tab. Sunlight has the ability to detect targeting in those ads, too, said Geambasu, but the researchers haven't yet given that a try. Sunlight's intended audience is regulators, consumer watchdogs and journalists. The tool lets them explore how personal information is being used and decide where closer investigation is needed, they said. "In many ways the Web has been a force for good, but there needs to be accountability if it's going to remain that way," said Chaintreau. "Sunlight is distinctive in that it can examine multiple types of inputs simultaneously (e.g., gender, age, browsing activity) to develop hypotheses about which of these inputs impact certain outputs (e.g., ads on Gmail)," said Anupam Datta, a researcher at Carnegie Mellon who led the development of the AdFisher tool and was not involved in the current study. "This tool takes us closer to the critical goal of discovering personal data use effects at scale." For scientist minded ... the full technical paper is here in PDF. AVG AntiVirus "force-installed" Chrome plugin that left browsing data vulnerable. If you are familiar with Network Time Protocol(NTP) particularity when used on a network/server, then the following might be of interest. It is likely too technical for most.... NTP is one of the most ubiquitous computer protocols and has been in use for decades. When most users think NTP they are thinking about setting a correct time on their computer by syncing with an atomic clock. Drop Box users will want to be aware of the following. In short, the 2012 hack of Dropbox did include passwords and other confidential data. The internet really does have a downside. I am reading a book now by Eric Larson entitled In the Garden of Beasts. Much of the source material came from written diaries that were kept by the people discussed in the book. Handwritten documents are probably the easiest to authenticate. I know that emails and things on the internet last forever, but how will one authenticate that they have not been compromised. I suspect that task may be impossible. Erik Larson is a great researcher and said that he does all his own research as that is the fun part. He is going to be the speaker at the fall fundraiser for our local library. Talking about those that are great researchers I am continually amazed at the three latest books by Catherine Holland. Virginia Silversmiths, Philadelphia Silversmiths and Eagle Marks on American Silver are amazing books that are a joy to have. Every time you visit a web site, your web browser sends lots of information to that site. The decision on what to do with that data, if anything, is down to the remote site. Some sites store it for marketing and analytics purposes. Other use it for technical reasons, such as to adjust the display to the capabilities of your computer or the size of the screen. The information that your browser sends is comprehensive. It always includes your IP address, from which the name of your internet service provider can be discerned. It also includes certain technical details about your computer and browser, as well as your location. As you can see from the screen shot included here, it even contains details of which fonts you have installed. The harvesting of large amounts of such data is not going to go away any time soon. Indeed, Twitter now collects details about the apps installed on your smartphone and lets advertisers use the information to target their messages towards people who use a certain application. If you want to find out what data your web browser is broadcasting to every site you visit, try going to https://tenta.com/test/ in your favorite browser. This site simply retrieves all the data and then displays it for you to see. The site in question is, of course, promoting a new browser which claims to block such information from being sent. It even claims to include a free built-in VPN. I'm still evaluating their claims so I'm not yet ready to say whether or not you should try their browser. But the page which reveals your data is both safe and enlightening. If I understand this correctly Google has set up DuckGo Duck as one of their default search engines on equipment they sell. Does anyone have experience with this search engine?